Money worries are currently one of the biggest problems facing families in the UK. Money problems are a major contributing factor in divorce, depression and stress amongst other things. This is all unavoidable when battling debt, but many people put themselves under this strain in order to save for the future, forgoing living in the present in favour of putting money aside. Whilst it is important to save to buy a house, a car, or to put some money away for your retirement, if it means you are sacrificing your happiness in the present, then the balance needs to be readdressed. Putting money away that you can comfortably afford to live without is great, but scraping by so that your future self and family will benefit will only lead to problems in the short term. Work out what you can live on, then add a bit more. Whatever is left after this you can save. Adding the bit more means that you can maintain some sort of quality of life whilst investing in the future. The extra can go towards little treats for the family, or be used towards a holiday or something larger. A holiday doesn’t have to mean an aeroplane and thousands of pounds - holidays in the UK can be great fun for the whole family and mean you can still carry on saving that year. 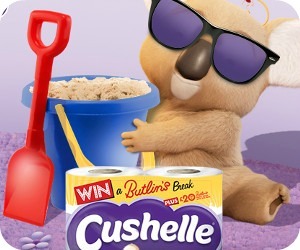 Right now you can win UK breaks with the Cushelle Online giveaway just by entering a code you can find on promotional packs of toilet paper. Don’t be afraid to take a month or two off from saving at more expensive times of the year, such as Christmas or the summer holidays. When money is tight, saving is where you can cut back, knowing that you can start putting away the pennies again when you are more comfortable. Always plan for the future, but don’t forget to enjoy life for the moment. Make memories with your kids rather than scrimp and save to buy them a house when they are grown. Make the best of what you have rather than constantly striving for more. Dreams are great, but never at the expense of the here and now.